CDC and K-8 families packed Trinity Lutheran Church for Back-to-School Weekend. The Back to School Open House events include special Opening Worship Services for our 400 students and their families every year. 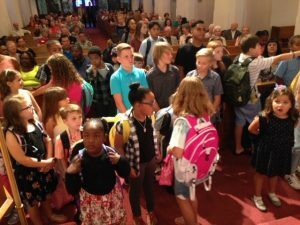 A favorite highlight of these worship services is the annual “Blessing of Backpacks” led this year by Pastor Larry Schaefer. 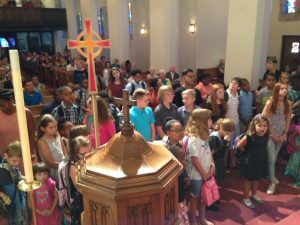 Students received a cross to carry in their backpacks as a reminder that Jesus is a constant companion each day of school, and the congregation prayed a blessing over the backpacks as the children gathered in front of the altar. The children came away with the assurance that Jesus walks with them, every day, during their school year. God, You are the creator of heaven and earth. You have given us an incredible world and so many amazing people. We ask you to bless each of these students and use these backpacks as reminders that what they learn in their classes, is ultimately learning about You. Help them when there is a hard test. Remind them that they are your children and you have blessed them with the ability to learn. Bless their teachers. Bless their families. Let their gifts come shining through so that everyone can see You living in them. Amen. School teachers were dedicated during these opening worship services as well — our Trinity Lutheran School CDC and K-8 teachers as well as those in worship who teach at local public, private, magnet and parochial schools in our community. Pastor Schaefer reminded those in attendance that everyone is invited to worship at Trinity, and also encouraged parents whose children aren’t yet baptised to feel welcome to ask their child’s teacher or contact the church ministry staff to talk more about it. And best of all, a schedule and new routine for families after the long summer break! This is sure to be another faith-filled and fun school year at Trinity Lutheran School!